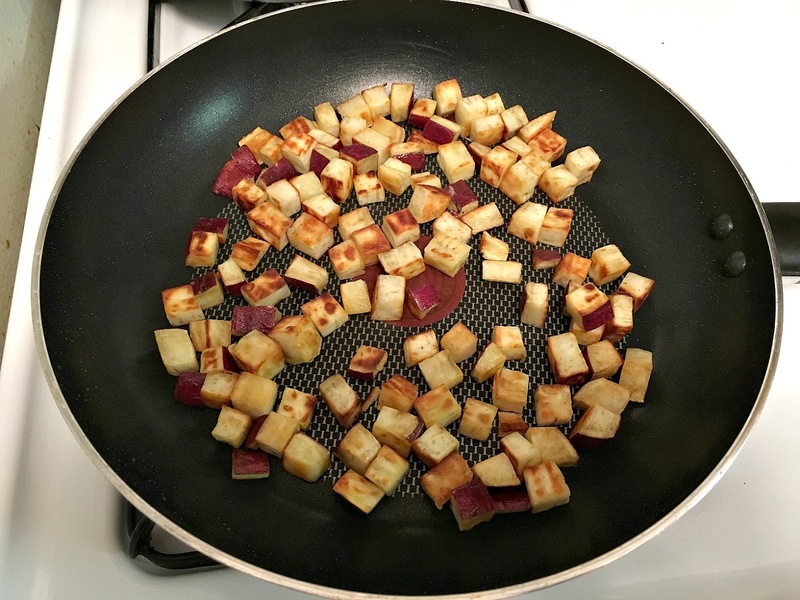 I have also been working on hash browns. A few years ago I wrote this post about my father's hash browns and how I never had the patience to make them myself. Now I find that it is no trouble at all - it's funny how things change. I had part of a sweet potato in the refrigerator so I decided to make my hash browns with those. I don't really follow a recipe, but I thought I would share my technique with you. This is about a third of a large sweet potato, cut into 1/4-inch cubes. I wanted a smaller cut so they would cook faster. 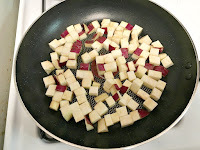 I filled my non-stick 10-inch skillet with about 2 teaspoons of grapeseed oil and heated the oil over medium high heat. When the oil was shimmering I added the potatoes and shook the pan to coat the cubes in oil and to get them as close to a single layer as possible. I lowered the heat and let them cook for 10 minutes without touching them. After that first 10 minutes I shook the pan to get the cooked sides up and then left it again for about 5 minutes this time. I shook the skillet to redistribute the potatoes and then left it for another 5 minutes. I tested a piece with a fork for tenderness and it was almost there. I left it alone for another 3 minutes and the potatoes were perfectly tender when I did the fork test this time. And then I added my spices. I try to incorporate turmeric and cinnamon into my diet on a daily basis so whenever the opportunity arises I use those first. 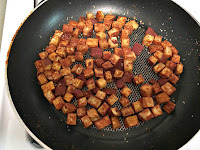 Those flavors work well with sweet potatoes so I added about a fourth of a teaspoon each of turmeric, cinnamon, paprika, and cumin and cooked it for about a minute until the potatoes were well coated and the heat had released the oils of the spices. I added salt at the end and then transferred the potatoes to a paper towel-lined plate to drain. 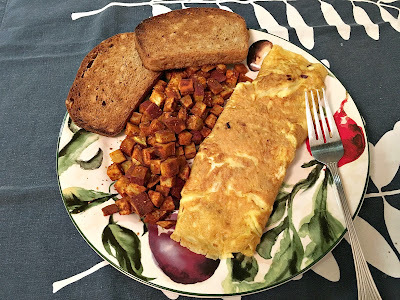 I made the omelette while the potatoes were cooking. I used the method that I wrote about here. I will be posting my recipe for the bread soon.